Through a series of expeditions up mountains and into rainforests, Museum scientists are figuring out exactly how frogs see the world around them, using a wide range of technologies in the process. As many species share their lives between water and land, amphibians are equipped with eyes that have to deal with a lot compared with most of the animal kingdom. Yet despite this incredible adaptability, surprisingly little research has delved into how amphibians perceive the world around them. Almost everything we know is based upon a few studies looking at a limited number of frogs. 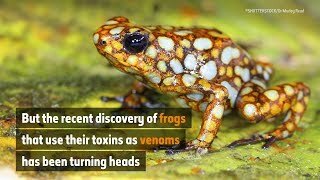 This creates a problem because frogs are incredibly diverse in what they get up to, from those that spend all their lives underwater, to some that pass their entire lives in the canopy, to others that live solely underground. 'There are almost 7,000 species of living frogs described so far, and they're not all the same,' explains Jeff. Scientists from the Museum, along with colleagues from the Smithsonian and the University of Texas at Arlington, have set out on a series of expeditions to the four corners of the world to investigate how frog visual systems have changed as the animals have adapted to different lifestyles. By looking at the amphibian family tree, the researchers were able to identify the most evolutionarily and ecologically distinctive groups. They then overlaid where these frogs live on a map of the world. This has taken the team to some of the world's most biodiverse places, stopping off in Australia, Gabon, and the Pacific Northwest coast of the United States of America. The latest expedition took the researchers to the remote rainforests of French Guiana in South America. With near-pristine forests and a tropical ecosystem, it is an ideal place to find a wide range of frogs. During their trips, the team have carried with them an impressive piece of equipment called a microspectrophotometer, built and run by Cornell University vision expert Ellis Loew. This instrument is used to measure which wavelengths of light - ranging from ultraviolet to infrared - are absorbed by visual pigments in the rod and cone cells in the retinas of frogs. These two types of cells are known as photoreceptors, with the rods being responsible for vision in low light and the cones when light levels are higher. This allows the researchers to determine how many visual pigments each frog has, and the range of wavelengths each frog species might then be able to perceive. In turn, this can help build up a picture of what the amphibians can see. Carrying out this experiment in the field is easier said than done. It requires the complex kit to be kept at a stable room temperature and in complete darkness - not easy to achieve at a remote research station in the humid jungle. It also needs fresh retinal cells. To do this, the scientists must first humanely euthanise the amphibian. Then, carefully, the eye is removed and dissected so as not to damage the tissue, and the retina is mounted on a microscope slide. Crucially, and as an added hurdle, this all has to be carried out in the dark so as not to activate the visual pigments in advance. 'You are putting the retinal tissue on the slide, and then that is taken and put into a microscope which is equipped with a very narrow beam that runs through all different wavelengths of light,' explains Jeff. This beam is then fired at individual rod and cone cells in the retinal tissue, allowing the researchers to measure exactly which wavelengths are being absorbed, and to determine which types of pigments are present in each type of photoreceptor. Fresh retinal tissue is used for other aspects of the project, such as studying which genes are expressed in the eyes of each frog. This is done by analysing the different RNA found in the eye tissue, an indication of which proteins are being made and thus which genes are expressed in the eye. But RNA is not very stable. 'RNA degrades very quickly after the animal stops making it,' says Jeff. Even with fresh tissue, the researchers need to use a special buffer to prevent the molecules from falling apart as soon as the animal dies. This means that tissues from Museum specimens are not feasible for looking at RNA. 'We're still a long way off from doing the same with Museum collections as what we can with the fresh tissues,' explains Jeff. 'So that's why we've got this hybrid approach where we're using some fresh collections, and then using both the Smithsonian and the Natural History Museum collections for the other bits, such as understanding how eye size has evolved among frogs. The Museum team, which also includes Dr David Gower, Head of Vertebrates Division, and Dr Kate Thomas, Postdoctoral Researcher, are looking at many aspects involved in how frogs see - from the ways in which they perceive light, to the genes expressed in the tissue and even the characteristics of the lens and shape of the eye. The researchers have one final stop off later this year, in Brazil, before turning their full attention to examining what the data can tell them about how amphibians see the world around them. The research is being funded by the Natural Environment Research Council and the National Science Foundation. Follow Dr Jeff Streicher and Dr Kate Thomas on Twitter. Find out more about Jeff's work on his website.